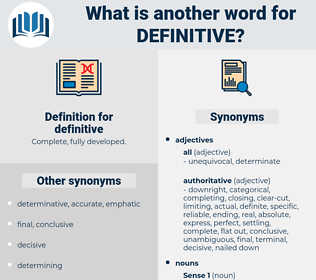 What is another word for definitive? 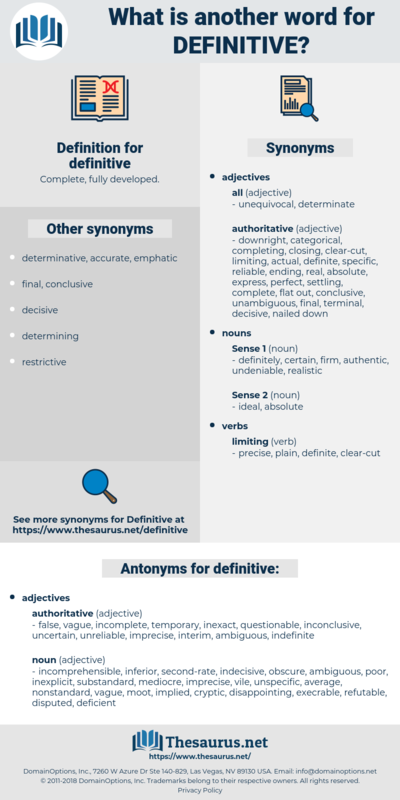 eventual, authoritative, specific, precise, once-and-for-all, categorical, unequivocal, crucial, well-defined, clear, defining, affirmative, determinant, explicit, finalised, determinative, irrefutable, lasting, clear-cut, exact, inconclusive, incontrovertible, concrete, unambiguous, absolute, compelling, thorough, common-user, accurate, complete, positive, comprehensive, exhaustive, determined, tangible, thorough-going, critical, defined, strong, firm, indisputable, fixed, resolute, detailed, reliable, formal, certain, emphatic. false, vague, incomplete, temporary, inexact, questionable, inconclusive, uncertain, unreliable, imprecise, interim, ambiguous, indefinite. mediocre, refutable, disputed, execrable, second-rate, failed, deficient, inaccurate, cryptic, poor, circuitous, unsatisfactory, substandard, bad, controversial, vile, disappointing, incorrect, indecisive, atrocious, nonstandard, obscure, ordinary, moot, normal, dark, low-grade, inexplicit, representative, typical, inferior, unspecific, wretched, implied, unclear, enigmatic, unintelligible, average, incomprehensible, disputable, inadequate. Tarry, I command you; and, I command you likewise not to stir till you have given me an answer, a definitive answer: Will you marry the lady, or will you not? Without the definitive collapse of the Imperial power no pacific league of nations can come to anything much more than armistice.